When I hear that something is a leather fragrance, almost always my first thought is, what kind? Leathers can be as oily and potent as a motorcycle gang’s garage hangout, or tender and soft as a well-used chamois. They can be salty or sweet. Sometimes the leather blends so well with the rest of the fragrance that it’s barely discernible, and sometimes it wallops you straight from the bottle. Parfum d’Empire Cuir Ottoman is a rich, comfortable leather with a soft but durable texture. If it were a leather article, it would be a saddle leather handbag you buy for its practicality, not glamour — despite how expensive it is — then wear so often that it becomes a part of you. Parfum d’Empire’s founder, perfumer Marc Antoine Corticchiato, created Cuir Ottoman and released it in 2006. Its notes include iris, Egyptian jasmine, styrax, tolu balsam, benzoin and incense. Cuir Ottoman doesn’t spend much time with vaporous top notes, but plunges straight into dry, buttery leather. After a few minutes, once it has proven it’s a leather scent, it relaxes, and jasmine steps forward to hum along with the leather, but not to turn it into a floral scent by any means. As Cuir Ottoman wears on skin, the ambery waft of tolu and benzoin rise to balance the leather’s dry edge. The fragrance gets a bit sweeter and more powdery over the hours, but to me it continues to smell like soft leather right up until its end. (Many leather scents seem to lose their leather halfway through wear.) Dabbed from a sample vial, Cuir Ottoman has good sillage, and it lasts easily from breakfast until dinner. The leather in my collection I find closest in style to Cuir Ottoman is Lancôme Cuir de Lancôme. Both fragrances are smooth and easy and tread the line between suede and leather, with Cuir Ottoman a bit drier. Also, Cuir Ottoman has more shape with its jasmine high notes and subtle scratch of incense, while Cuir de Lancôme stays more watery-cool with shades of summer flowers. Cuir Ottoman also wears at least a third longer than Cuir de Lancôme. In my opinion, every perfume collection needs a core of well made, non-freaky fragrances you can wear easily. For the days you’re not up to the attitude of a leather fragrance like Piguet Bandit, you can reach for Cuir Ottoman with confidence. Parfum d’Empire Cuir Ottoman Eau de Parfum is $145 for 100 ml. For information on where to buy it, see Parfum d’Empire under Perfume Houses. Note: top image is detail from Sultan Suleiman I taking control of Moldova. 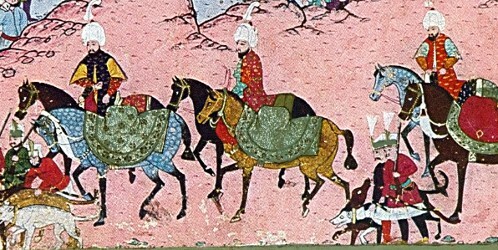 Ottoman miniature painting from the Hünername, kept at the Topkapı Sarayı Müzesi, Istanbul, via Dariusz caballeros (full image available at Wikimedia Commons). I love Cuir Ottoman! I have a decant now but I think I’m going to need a bottle when that’s used up. I find CO comforting and it’s become a go-to on days when I need that. I can’t believe it’s taken us so long to review it! I can see why it’s a comfort fragrance for you. I’m close to getting a bottle of Tabac Tabou, but if that falls through, it might just have to be Cuir Ottoman. Cuir Ottoman is one of my favorite, if not a favorite leather perfume & also my fave from Parfum d’Empire next to Azemour. I value it especially for it’s intensive character and a gorgeous iris that really blooms on me in this perfume. What I notice – when I spray it, I get this “artificial”, plastic-like smell of leather. When I dab it, I don’t get that phase, it becomes more suede-leather immediately then. Thanks for the recommendation on Cuir X! I don’t know much about Parfumerie Moderne, but I’m going to read up on them right now…. Aha! I just found a sample of Cuir X in my “to be smelled” pile. It goes to the top of the list. Uh oh — I was all intrigued until I read your “plastic-like” comment. Does this mean that you get a patent leather kind of effect from it? I don’t find it plastick-like, but it does have that dry leather edge which, although not oily in this case, has a hint of something industrial. Hmmm. The price for 100 mls is not horrid- not cheap, but not horrid- and compares favorable to Cuir Lancome? Okay! I think I can spring for a decant! They used to be even less expensive *sob*. But they’re a relative bargain these days. One of my all time favorites! I also have Cuir de Lancôme, which I enjoy as well, but prefer CO as it tends to lean a bit more feminine on me. I am kicking myself for not get a 50ml bottle before they were discontinued. So SAD! I know! Those 50 ml bottles were great. One of my favorites too. The canisters make great pencil holders for my desk. Nice move both aesthetically and environmentally! Andy Tauer metal boxes are great for lipsticks. I try to multipurpose all my packaging. Those metal boxes are so great! I love how you reuse them. I like Cuir Ottoman… but on me, it loses its leather after four hours or so (very long-lasting, relatively speaking) and becomes a very, verrry sweeeet amber. Like almost caramelly sweet. I start getting bored with it about an hour after the leather wanes. Oh yeah, if that were the case on me, I’d get bored with it, too. Although Cuir Ottoman definitely gets sweeter and a touch more powdery, it hangs onto its leather–almost suede-like–on my skin, which really surprised me. Thanks, Angela – this is one of my all-time favs! I’d wear it all the time if I’d bought the larger bottle. I think I’ll wear it tonight and enjoy our unseasonably cool weather. Thanks for this review, Angela! I haven’t explored all of Parfum d’Empire’s offerings yet, but I’ve been impressed so far with Azemour and Corsica Furiosa and Tabac Tabou — all very distinctive and ideosyncratic in a world where too many things smell like too many other things. Those are my favorites! Yes, I’m always interested in what comes up in this line. I feel like they’re a good value, too.